Gary Neverman is a person who likes to study things extensively before taking action. Before he started Nev’s Ink, located in the Milwaukee, Wisconsin, suburb of Waukesha, he learned the business inside-out—but as a sales representative for another label producer. Today, the two-shift, five-days-a-week operation at Nev’s Ink ships specialty labels, primarily to the health care market, throughout the United States and Canada, and to seven other countries. 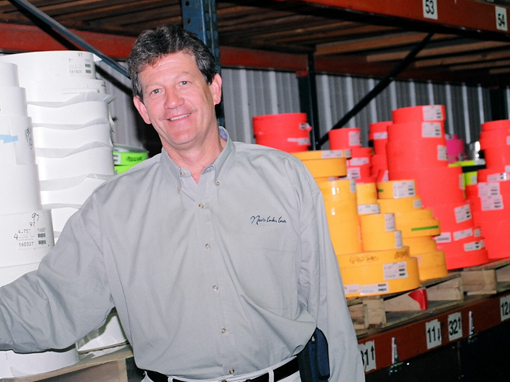 Neverman’s goal is to maximize quality, minimize turnaround time, and provide consistent service to customers. When Nev’s Ink opened in 1989, the business was run using basic accounting software only. Orders were entered manually, and invoices were typewritten. But as the business expanded, Neverman found he was unable to keep track of finished goods inventory, so he began to search for a more comprehensive business management computer system. He discovered Tailored Solutions’ Label Traxx software for label printers, and then spent the next four years studying how the software worked. Says Neverman: “I made a lot of calls to Tailored Solutions president Ken Meinhardt, asking questions and making suggestions about improvements, even though I didn’t own the software.” Then, in 1996, Nev’s Ink installed Label Traxx and never looked back. The initial installation consisted of two Macintosh computers, but today Neverman has some 25 workstations scattered throughout his two-building operation. He provides employees with either a Mac or PC, depending on their personal preference, since Label Traxx enables him to mix the computers on the same system. All of Nev’s Ink 38 employees log on and log off Label Traxx to use it, enabling Neverman to track productivity without requiring workers to punch a time clock. Because Nev’s Ink has a great many stock products which it ships to customers in quantities as small as single rolls, the Label Traxx Stock Products module is especially important. Employees can put find the exact location of any finished product quickly and accurately. Stock items are typically shipped the same day as ordered, or within 24 hours if ordered late in the day. Custom orders are shipped an average 3.5 days after order entry. Bar codes are used to keep track of both finished goods inventory and raw materials. Nev’s Ink customers also use Label Traxx, specifically the E-Traxx module, which enables them to check their order status on-line, without involving any of Nev’s Ink eight customer service representatives. Neverman, who does a sizeable credit card business, is encouraging Tailored Solutions to expand E-Traxx capability to include shopping carts, seamless ordering, and packing slips that print out automatically when customers enter an on-line order. Customer retention is one of Neverman’s key issues, and he estimates that 98 percent of customers actually reorder from Nev’s Ink. Because of the efficiencies realized in the company operations, Nev’s Ink is able to pass significant cost savings along to customers.